Have you heard of IMPOSTOR yet? It doesn't come out until July 2013, but I have an ARC that I want to pass on to a reader because it's so much fun! Let me tell you a bit about it. Tessa is a variant who can change her appearance and become anyone. Rejected by her family, Tessa is recruited for a special branch of the FBI (full of variants with different special powers) and sent on a mission to impersonate a murder victim (a girl named Madison) and catch a serial killer. I was super excited to read this because it's like a girl with the powers of X-Men's Mystique (but without the evil intentions) in a set-up similar to THE LIKENESS by Tana French (one of my favorite books ever). IMPOSTOR's plot very much in the mystery/thriller vein - the story presents a bunch of likely candidates for Madison's murderer and Tessa has to narrow them down, before it's too late. But at the heart of the story is Tessa's desire to belong and her sweetly awkward romance with a fellow variant. Intrigued? 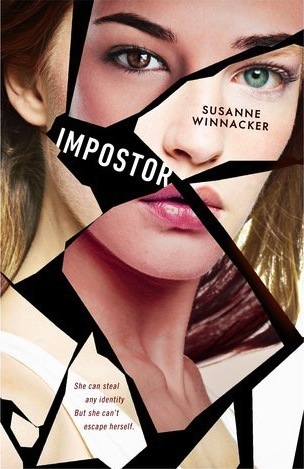 For a chance to win an ARC of IMPOSTOR, simply fill out this form by Dec 20, 2012 at 11:59 pm CST. Open internationally! Find out more about the book at the author's website. It reminds me of the character of Tonks in the Harry Potter world! This sounds like an awesome book! Thanks for the giveaway!! You wrote Tana French and I got ready. :) Thanks for hosting! whoaa! Impostor sounds amazing! thank you so much for the giveaway!! =DDDDDDDDDddd yay!! The Book of Blood and Shadow was in some people's book boxes at ALAN and I was so bummed I didn't get it. I read the synopsis and I was like, "Must. Read."